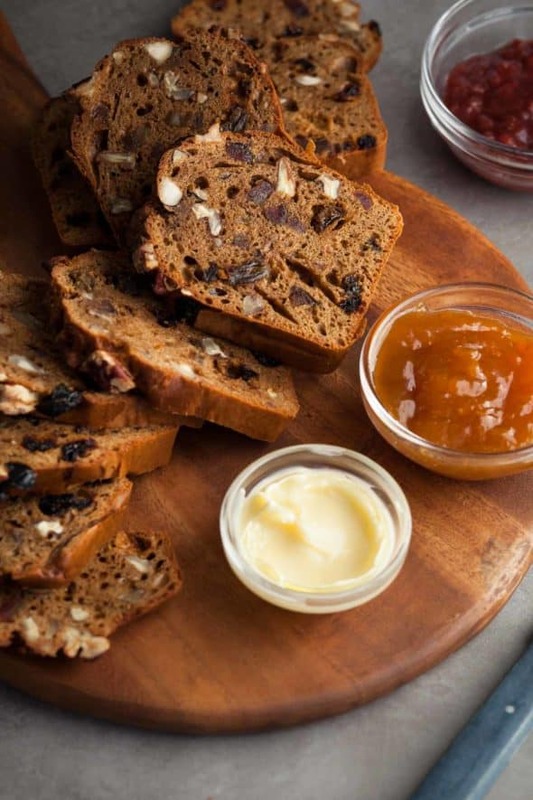 A simple and hearty quick-bread filled with dried fruit and nuts. It’s officially the start of baking season, and I for one am ready to pull out those mixing bowls and crank up the oven! There’s nothing quite like the satisfaction of biting into a warm cookie , or the lingering scent of baked goods in the air. And while bold flavors like cinnamon and ginger tend to dominate this time of year, I also appreciate the more subtle flavors of this fruit and nut cake. 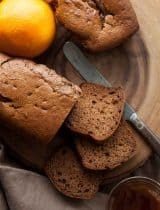 No, not the often mocked and reviled fruitcake, but a quick-bread with a hearty yet understated character that’s nothing like the aforementioned artificially colored candied fruit nightmare. 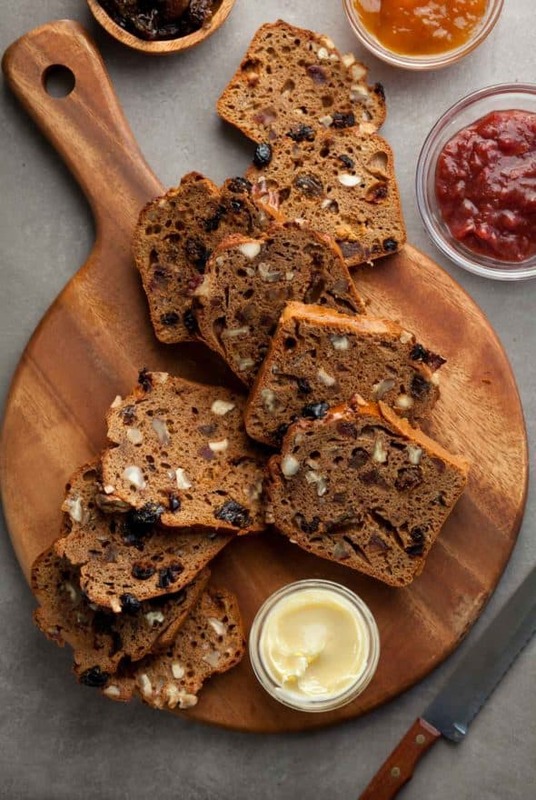 This loaf is packed with chewy bits of dried fruit like dates, raisins and cherries along with nuggets of pecans and hazelnuts, in a batter lightly scented of vanilla with just a pinch of cinnamon. 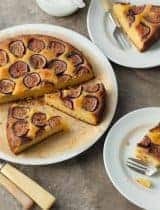 It’s a snacking cake, the kind you serve for breakfast, brunch, or an afternoon nibble, warm or toasted with plenty of butter alongside. 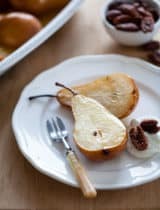 It’s just barely sweet so as to stand up to both sweet and savory toppings like fruit butters, sliced pears, a spread of goat cheese or melted brie. What I also love is that it’s a one bowl kind of loaf that doesn’t even require a mixer. Everything is quickly stirred together and poured into the pan (or muffin tins if you prefer) within minutes. What you end up with is a bread that’s moist, chewy, dense and nutty in every bite. If you’re need a hostess gift this season, consider doubling the recipe and wrapping up a loaf to take with you as it keeps well for days. 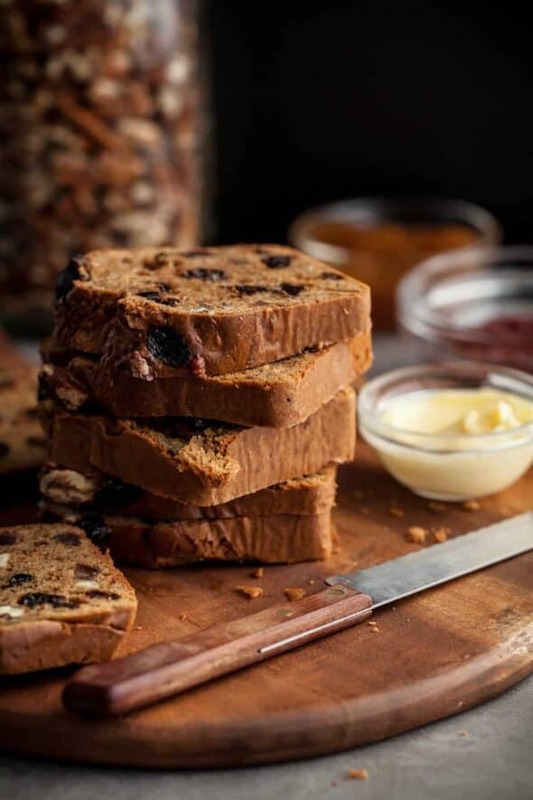 A simple and hearty snacking quick-bread filled with dried fruit and nuts. Preheat the oven to 350°. Prepare two 6 inch loaf pans with parchment paper. In a large bowl whisk together cashew butter, almond butter and eggs until smooth. Whisk in coconut sugar, vanilla extract, cinnamon, salt, baking powder until well combined. 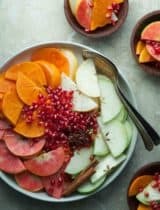 Stir in dried fruit and nuts. Scrape the batter into the prepared pans and place on a baking sheet. 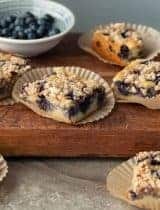 Top with extra dried fruit and top. Bake for about 30-35 minutes, until the loaves are puffed and browned and a cake tester inserted in the center comes out clean. Transfer the loaves to a rack and let cool to room temperature. Love this ! So delicious and perfect for the fall ! There is no "flour" in this recipe? No, this is a flourless bread! Wow! 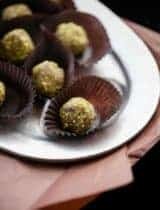 This would be the perfect hostess gift!! The idea of topping this yummy bread with goat cheese or brie sends me to the moon!! This bread sounds fantastic, I would love to enjoy a slice with a cup of coffee! Love all the fruit you snuck in this bread. Usually I feel guilty eating quick breads, but this is so healthy! You're welcome, I hope they loved it! I tried this recipe and it is DELICIOUS. One of my absolute favorites! 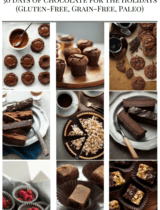 I would like to make this for someone who has a nut allergy- do you think it would work to replace the almond/cashew butter with seed butters such as tahini/sunbutter? Thanks for the amazing recipes!! Thanks! I haven't tested a tahini/sunbutter combination so I cannot say for certain whether it would work but it sounds like a good substitute. I would note that the acid in the baking powder may react with the sunflower butter and create a greenish/blue tint in the center but will not alter the taste.